You probably are thinking, who the heck wears or cleans hats anymore? You would be surprised to know there are many. I had just about discounted any possibility of there being anymore hat cleaners around until I did some research. Most western towns have lots of folks wearing hats. Many rich people in suits in all states west of Texas and Colorado may wear beautiful 5x beaver hats at the range from a decent one (like I wear) from $150 to a $1,000 plus. All kinds of shapes, sizes and materials. There are not too many east of the divide but there are a few. Naturally, when I would work in New York and other eastern states, I would get a pretty hard stare. But then, the old cowboy always did wear those boots and hats and still do! I don’t give a hoot what anyone thinks. The history of hats goes a long ways back and don’t be surprised when they return back in full force. The business men’s hats only went out in the late 196O’s. President John F. Kennedy cut the trend when he became the first United States President to not be sworn in with a top hat. Sales went into decline then but they never did for the cowboys or westerners. Even ladies once wore hats to church. More and more I see women coming to church in a hat. Even gloves. Remember when they were in style? They will come back. History always repeats itself. So who cleans the hats and gloves? Specialty cleaners across the country. I remember when there were more hat cleaners all over the country. Drycleaners will wake up some day needing hat and glove cleaning skills that have been lost to past generations before the 1960’s. These folks were professional hat and glove cleaners. Some of you will remember them. We had several really good hat cleaners in Southern California at one time. Not anymore. There are a few in Northern and Southern California but they are far and few between at this time. All that will change. I remember telling folks that going to blow dried sleeves on a shirt unit would become history eventually. No one believes me and the trend is still for the soft feel finishing. That too will change. More and more people and particularly servicemen are wanting those creased sleeves again as they have found that a hot air blown soft sleeve finish just don’t look right. As they say, everything cycles and sooner or later the rooster will come home to roost. We will be out buying equipment again. I realize that most people other than me are trendy. Most folks want to “keep up with the Jones’s or be part of every new style change whether it’s fancy clothes or phrases of the day. Me, myself and I don’t. I never sought to be like the status quo. Maybe I am an old rooster that needed to be parked somewhere but don’t forget that most of our advice comes from folks who have already been where we are. I listened to anyone that was older than me and always remembered that change is not necessarily for the better. I had an old salesman guy in Arizona tell me that – once in the early 1980’s and I never forgot it. It is advice we still give to people who become managers or want to buy a cleaners. They all think they can change it for the better. Sometimes they do but more often they don’t. There usually is a reason someone is doing it the way they have for 50 years! Back to hats. Anyone with the skills of a trained spotter can surface clean a hat. It is like cleaning by steam as we do so often with clothes that cannot be immersed in a liquid. I have cleaned a many a hat just on the spotting board. Sometimes using chemicals too. But one needs blocking forms and equipment to properly clean a hat or gloves and the right stuff and manner to put it all back together again. It is a lost art. It shows the skill and adventure of someone who seeks to clean just about anything that comes in the door. I rarely if ever refused to clean something for a customer. If you don’t, someone else will. They will be a loyal customer to the cleaner who goes overboard to help them instead of turning them away because you have not the skill or fortitude to learn beyond the mediocre parameters we have set ourselves at over the past 40 years in this industry. Mediocre cleaning and service. I don’t like it. 1. To clean, brush the top and bottom counter clockwise with a soft brush. 2. Set your hat on its top or hang from a peg/hat hook to retain shape. 3. If your hat gets wet, shake off all excess water, let dry, then lightly brush clean. 4. Use steam to shape and clean hat. For heavy stains, powdered cleaners may be used. 1. Keep clean and fresh by brushing with a small whisk broom or sponge lightly with a damp cloth. Use window cleaner for heavier stains. 2. Store hat on its top or hang from peg/hat hook to retain shape. 3. Keep most straw hats from getting soaked with rain. If your hat gets wet, wipe off the excess water with a dry cloth. Then, with the brim turned up, place on a level, clean surface to dry. 4. Steam your hat to reshape, if necessary. 5. Do not use artificial heat. 1. Brush your hat with a nylon/slightly stiff bristle brush to get out loose dirt and dust. Brushing periodically keeps the suede looking fresh. 2. Buff any matted suede or caked on dirt with emery cloth or fine grit sandpaper. It is important to choose a grit that matches the finish of your hat; 120 grit works well with most suede hats. 3. For light colored leathers, a suede bar (a suede eraser) works best on most stains. Move the suede bar in a circular pattern to “erase” the stain. You may need to work the material aggressively for set in stains. Then brush again with the suede brush. 4. Oily stains from sweat cannot be removed completely. You may remove most of the oils and odors with a mixture of 1 part baby shampoo and 15 parts of warm water. Use this mixture with your suede brush. 5. When hat gets wet, shake off excess water and let dry. Then brush clean. 6. Steam clean to get rid of water spots or reshape your hat. 1. Leather hats should be periodically treated with leather dressing like minks oil, neatsfoot oil, or similar products. Be sure to avoid saddle soap, as that may dry your leather hat. 2. Once conditioned, your hat is ready to wear in any season. Avoid getting your hat wet, then placing it near heat. Also, avoid placing your hat in direct sunlight for extended periods, as such exposure may shrink the hat to a smaller size. 1. If your cloche hat is waxed or oiled cotton/canvas, simply hose off when dusty or dirty. 2. 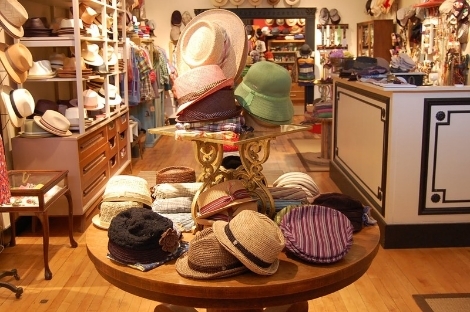 If your cloche hat is made of untreated cloth, use a stiff bristle brush to clean. In the event you have heavier, set in stains, powdered cleaners may be used to clean. 3. You can clean your canvas hats with a damp cloth. For heavier stains, you may use powdered cleaners. These are but a few tips. Of course this does not replace professional hat cleaning and blocking to be put in a machine. Thanks to all who contributed their ideas. Enough about hats. I’m headin to the wagon now, these boots are killin me!